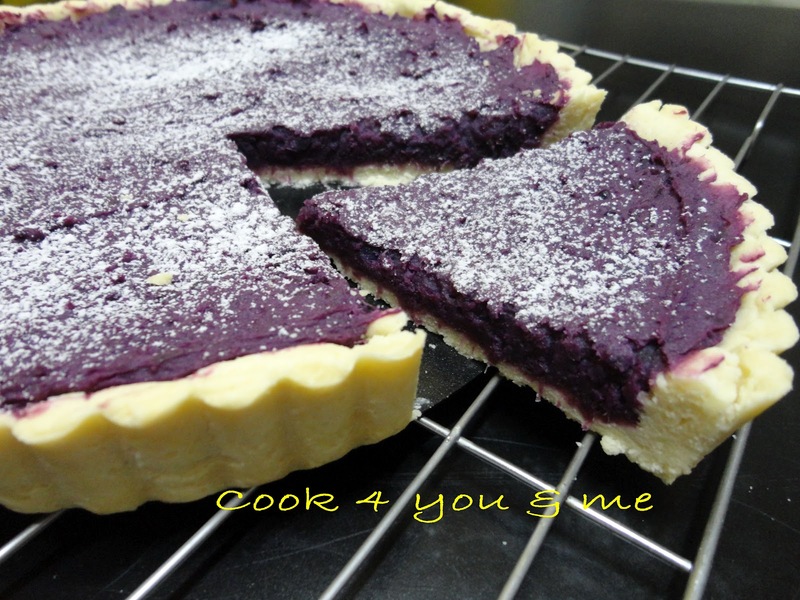 This recipe is from a book name '100 Desserts'.When i reading this book,this is the 1st recipe i want to try.I love the colour.It healthy too.Purple sweet potato is very sweet and very fragrant. 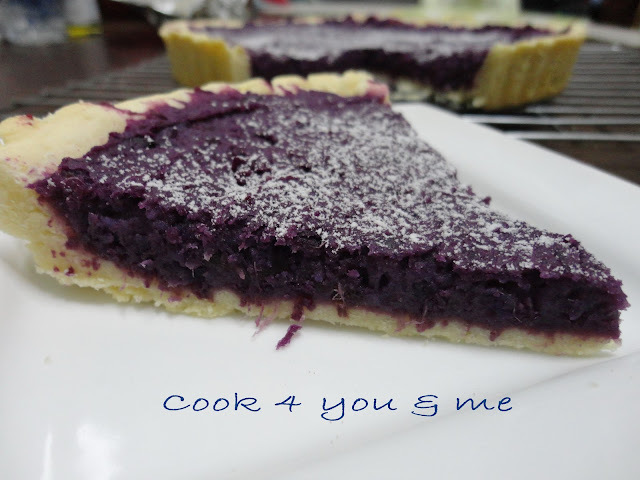 My family love this pie very much.I also love it.Will make again,because i bought purple and yellow sweet potato.I think two colour will look more nice.My colleagues not yet try this pie. Mix the flour and icing sugar together.Add diced butter to the dry ingredients.Knead with your fingertips until it resembles breadcrumbs. Pour in egg and mix well until become a dough. Leave it rest in fridge for 30 minutes. Roll the dough thin.Press the dough into the pie pan. Prick holes with fork.Line the crust with baking paper and put baking bean or rice inside on the crust. Bake in preheated oven at 180'c for 10 minutes.Leave it to cool. Slice sweet potato thinly and steam until soft.Mash it while still hot. Add the remaining filling ingredients and stir well. Put in the filling on the pie crust. 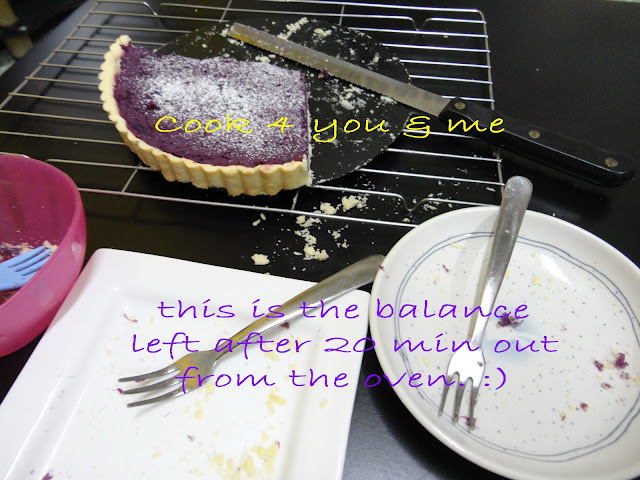 Bake in preheated oven 180'c for 15 minutes. Sprinkle some icing sugar on top as garnish. lovely pie! love the colour too. 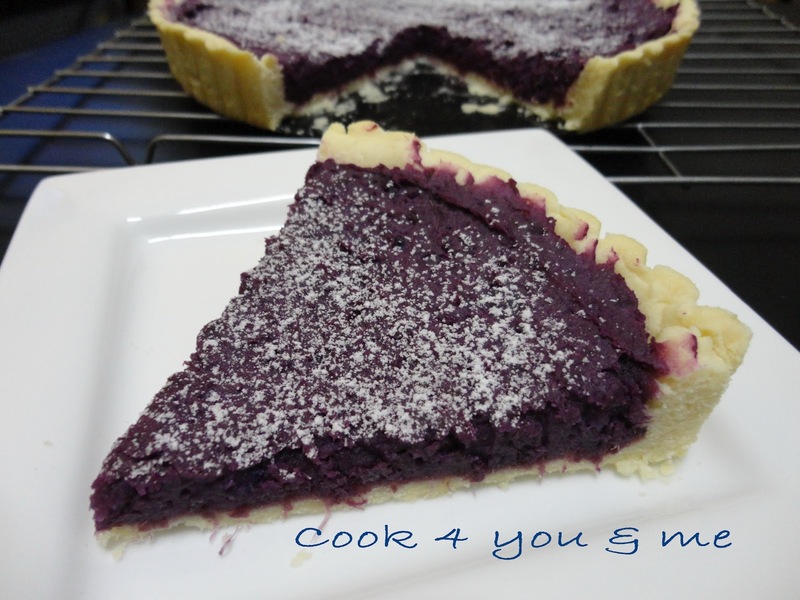 Pie with lots of fibre from the sweet potatoes filling. Tumbs up! Hody, I am sold. The last photo says it all! Good job. Can i ask a question? i don't understand step no 6. After press the dough at the pie pan then " Line the crust with baking paper and put baking bean or rice inside the crust ". U mean after put the dough then cover it with baking paper is it? And what is baking bean or rice inside the crust? Thanks for your reply. Will try it soon.